"The iconic sound of one of the world's biggest rock bands. With six Grammys and two Brits, bands don't come much bigger than this. 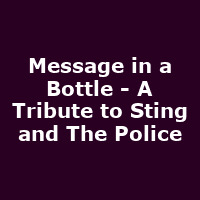 With a distinctive sound and unforgettable songs, relive Sting and The Police with this unmissable pitch-perfect production - Message in a Bottle. The ultimate tribute to Sting and The Police."